Using the Pay What You Want add-on for Paid Member Subscription you can let your subscribers set the price they want to pay for a subscription plan. The subscription standard price will be used as the recommended price and you can also set a minimum and maximum amount. Pay What You Want is a Basic add-on, available with a Paid Member Subscriptions Hobbyist or Pro license only. Once downloaded, you can install the add-on as a normal WordPress plugin, by uploading the .zip file in your WordPress Admin > Plugins > Add New > Upload Plugin. Alternatively, you can install the Pay What You Want add-on by extracting the folder found inside the archive and uploading the entire folder via FTP to your /wp-content/plugins folder found inside your WordPress install. 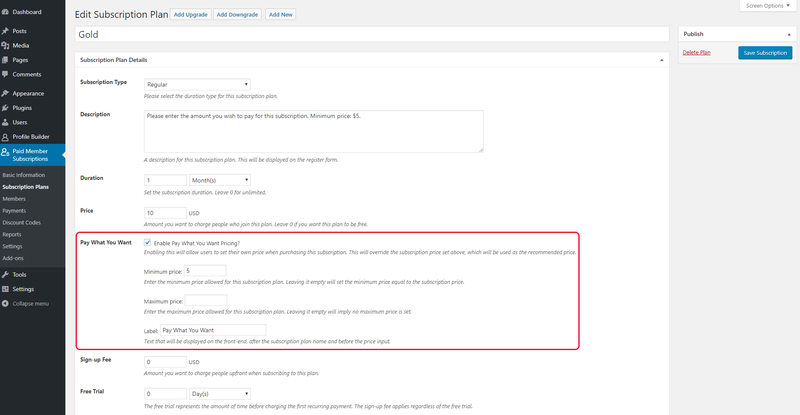 After activating the add-on, simply create a new subscription plan by navigating to Paid Member Subscriptions > Subscription Plans and clicking “Add New” button. The standard price set for the subscription will be used as the recommended price. You can use the “Description” field to let your users know the minimum or maximum amount allowed.